One thing you almost never hear from homeowners after they remodel a kitchen is: "I wish I'd spent less time researching my project before I started." So be sure to do your homework and compare options, especially when it comes to the cabinetry, which accounts for as much as 40 percent of the cost to remodel a kitchen. Well-chosen cabinets are not only convenient and functional, but also offer good looks and appealing ambiance. What's more, the right cabinets add buyer appeal and resale value when you sell your home. Read these tips to choose the best kitchen cabinets. 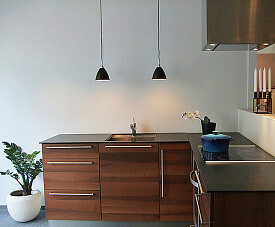 Kitchen cabinets are available as 3 basic types -- stock, custom, and semi-custom. Stock refers to "off-the-shelf" models, which come in standard measurements (24" deep X 34.5" high for base cabinets and 12" X 30" or 42" for uppers) and a limited number of designs. Buy either the ready-assembled or the flat pack version. Choose stock cabinets if you are on a limited budget and/or in a hurry to complete your kitchen renovation -- they are the least expensive variety and do not require any lead time to construct. Custom means cabinets that are designed and built especially for your kitchen remodel, usually by a local carpentry contractor. The costliest type of cabinetry, they're great for unusually shaped kitchens and for discerning tastes. Opt for custom cabinets when you're prepared to spend more to get the uniquely personalized style you want. Allow 6-8 weeks for your cabinet to be custom built to your specifications. Semi-Custom cabinets generally are factory-made, mid-priced, and manufactured to standard measurements, but offer you some leeway in customizing details like door or drawer style and trim. Take note, though, that the more changes or additions you make to the basic design, the longer you'll have to wait for your cabinetry to be ready. Educate yourself about the wide variety of cabinet materials, features, and accessories available these days. Study the photos on architecture and design websites and magazines to discover what will suit your family's needs and preferences. Materials. Over 90 percent of kitchen cabinets are made of wood such as maple, oak, or cherry. Within this category, you have a broad selection of solid hardwoods or softwoods. Select the kind that appeals to you, bearing in mind that "blond" or light-colored woods will visually enlarge a small kitchen. Use naturally dark woods, like alder, or dark stains to add a touch of drama in a larger space. Two less costly wood-look alternatives are: 1) veneer cabinets, made of a thin layer of quality wood over a plywood base and 2) laminate cabinetry, consisting of a image of wood grain adhered to particleboard. Design Features. Have fun with the special features that will transform your new kitchen cabinets from ordinary to oh wow! How about glass cupboard fronts, display racks for your finest china, or decorative carpentry work like beveled doors or molding? Accessories. Some of the newest accessories in kitchen cabinetry are designed either to allow universal access, such as easy-close doors and shorter base cabinets to fit lowered countertops, or to accommodate 21st technology (for example, a handy built-in electronics charging station). If you're planning to sell your home, be aware that a practical, attractive modern kitchen is top of the "must-have" list for most buyers. Some 90 percent of house hunters look for homes online, and most of them scrutinize photos with an eagle eye. The best kitchen cabinets to appeal to home buyers feature contemporary styles and colors, with trendy hardware and popular features like appliance-concealing cupboards. At the same time, cabinetry that is too intensely personal is likely to turn buyers off. That means a screaming red lacquer finish is out.